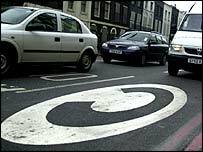 Congestion charging could end half an hour earlier than at present when the zone is extended westwards, Transport for London (TfL) has said. The change to 6pm is part of revised proposals which could be in place by February 2007. The plans include modified boundaries for the extension zone, going less far north and west, and discounts for those living just outside the zone. A public consultation on the new scheme is being held until 15 July. The revised area would not go as far into Earl's Court in the west as previously thought and less of Kensal Green in the north will fall within the zone, TfL said. The revised hours for the whole zone are intended to boost London's theatre, cinema and restaurant trade. There has been opposition to the extension from residents and businesses in the area. They say the roads are not congested enough and people should only pay a fee for using certain busy routes. But Transport for London says congestion will be reduced by up to 20%. Currently the charge stands at £5 per day between the hours of 7am and 6.30pm, but that is due to go up to £8 in July.